I recall once visiting a church, and on that morning the pastor said, “If you don’t tithe before you pay your electric bill, then you are sinning against God.” As I eagerly awaited the Biblical evidence, not surprisingly he produced none. On the contrary, a simple survey of Biblical passages on tithing shows another conclusion entirely. The first Biblical mention of the concept is in Genesis 14:20 (and discussed in Heb 7:7-10), when Abraham gave Melchizedek a tenth of the spoils of victory. Importantly, Abraham did so voluntarily, and was not under any legal requirement to do so. Hence, Abraham’s actions in that instance are as binding on future generations as his preparing meat, curds, and milk for visiting strangers (Gen 18:6-7). Outside of that context, the other 34 Biblical mentions of the tithe are all within the confines of the Mosaic Law and the days when Israel was under that Law. All of them. And the tithe wasn't just money—it was land, seeds, and fruit too (Lev 27:30). Then, along with the tithe, there were burnt offerings and sacrifices, votive and freewill offerings, and the firstborn of the herds and flocks (Deut 12:6). 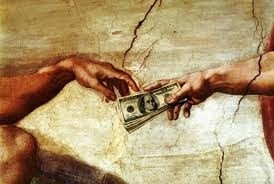 And then there was the tithe of the tithe (Num 18:26). There was even the “year of tithing” (Deut 26:12). Further, the tithes had to be presented to the tribe of Levi at the place the Lord selected (Deut 12:11, 17; 14:22). God took the tithe seriously, rebuking Israel for failing to present the tithe (Mal 3:8-10). The tribe of Levi was not given a land inheritance at the level of other tribes, and the Levites spent so much of their time administering the Mosaic Law that they had no time to work the land as the other tribes did. Hence, the tithe was designed in part to support the tribe of Levi. Now this I say, he who sows sparingly will also reap sparingly, and he who sows bountifully will also reap bountifully. Each one must do just as he has purposed in his heart, not grudgingly or under compulsion, for God loves a cheerful giver. And God is able to make all grace abound to you, so that always having all sufficiency in everything, you may have an abundance for every good deed (2 Cor 9:6-8). Giving is not to be done sparingly, and should be based on what each one has determined (no rules about percentages, etc. ), and should be done with good cheer. Further, we need to remember that when God blesses with physical blessings it is for good deeds. Finally, we need to understand that Christian giving is designed to help the poor (2 Cor 9:9) and to meet the needs of the saints (2 Cor 9:12). We are to help believers and those who aren't believers (Gal 6:10). So, not all of our giving must be funneled through the administration of a local church. Sometimes that is the best way to meet the needs of the saints and the poor, but sometimes it isn't. We have freedom in areas such as these.